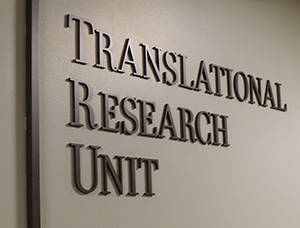 The ITHS Translational Research Unit (TRU) offers investigators the support and infrastructure needed to conduct clinical and translational research. This support includes access to dedicated inpatient and outpatient facilities, specially trained nurses and support staff, laboratory services, and state-of-the-art equipment. On-call nurses from the TRU are also available to travel to inpatient units at the UW Medical Center to complete clinical research activities. The TRU is located in the UW Medical Center, which allows study teams to safely conduct early phase research studies. The TRU offers ten private and semi-private beds, office and computer space for research teams, a CLIA-certified laboratory, meal services, and two consultation rooms. The TRU staff is experienced in supporting a variety of therapeutic, observational, and interventional clinical studies. Their areas of expertise include immunotherapy studies; high-volume and/or serial, closely-spaced blood draws; and pharmacokinetic studies. Our registered nurses and study coordinators possess significant experience and expertise in clinical and translational research. They draw from this background as they support investigators and study teams in successfully navigating the different phases of research. For subjects under the age of 14, please visit Seattle Children’s PCRC. 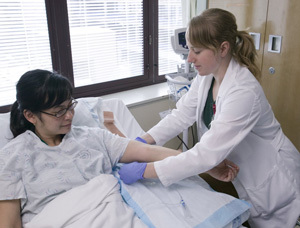 On-call registered nurses from the ITHS TRU are available to travel to inpatient units at the UW Medical Center to complete needed clinical research activities. This service ensures that all research protocols can be accommodated during anticipated and unanticipated admissions while a participant is enrolled in a research study. There is no cost to request an estimate or register a study for this program, with charges only occurring when an ITHS nurse is actually deployed. All grant proposals submitted that intend to utilize ITHS TRU nursing services at the UW Medical Center will need to include costs for these services. To obtain estimated costs to include in your grant budgets, or to obtain estimates for already-funded projects, please request your estimates through the “Request Services” form below. Costs are based on our current rate sheet. You will receive an estimated budget, including applicable subsidies, suitable to submit with your grant proposal within 10 working days of submitting the template. Note that 10 working days lead time is required to assure a timely turnaround for ITHS estimated budgets. Costs can also vary between budget cycles. The ITHS budget cycle runs from March 1 to February 28(9) of the following year. Costs for use of the TRU are shared with investigators. The TRU is open to industry-sponsored studies. Note: hospital services separate from those provided through ITHS will continue to be charged at hospital research rates. Thursday – closes at 7 p.m.
Friday – 7 a.m. to 4 p.m. The TRU is located in the University of Washington Medical Center on the 7th floor of the Pacific Tower. 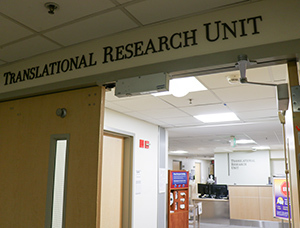 Take the Pacific elevator up to the seventh floor, make a right turn and you will see the Translational Research Unit (7 South). Please use this form to submit quick questions. We ask that you submit requests for costs estimates and services through the “Request Services” form below.